Will Powerbeats Pro beat Apple's AirPods? APPLE'S new AirPods have a hot competitor - from a company owned by the tech giant. Beats by Dr. Dre has launched Powerbeats Pro, completely wireless earphones which combine great sound and clever Apple engineering. And importantly, they come in more than just white - and a signature earhook which means they are less likely to fall out. Beats president Luke Wood said Powerbeats Pro offered "a harmonious blend of premium sound, fit and functionality. "No longer do you have to choose between performance and practicality. It delivers the best on both fronts." Beats says the earphones boast an upgraded linear piston driver that leverages an efficient, pressurised airflow to create a powerful acoustic response in a small package. The new Powerbeats Pro by Beats. The enhanced sound quality promises low distortion and great dynamic range. To ensure an even better fit over 20 configurations were electronically modelled and physically tested. The result is a new, ergonomically angled acoustic housing that nests comfortably in the concha bowl of the ear with an off-axis nozzle. It comes with four sizes of ear tips and a redesigned and adjustable earhook. Powerbeats Pro is 23 percent smaller than its predecessor and 17 percent lighter. While not waterproof, it is sweat and water-resistant. It features physical volume and track controls on each earbud though with Siri support, iPhone users won't need those as much. Long and short-range optical sensors drive automatic play/pause and call handling when the earphones are placed in or removed from your ears. The Powerbeats Pro also promise exceptional call clarity. A speech-detecting accelerometer in each earbud and two beam-forming microphones per side target your voice and filter out external sounds such as wind and ambient noise. Each earbud has up to 9 hours of listening time and more than 24 hours of combined playback with the magnetic closure case. With Fast Fuel, you get 1.5 hours of playback after just 5 minutes of charging and up to 4.5 hours after 15 minutes of charging. For those with an iPhone, you can simply say "Hey Siri" for voice-activated assistance without having to reach for your iPhone. Powered by the new Apple H1 chip, Powerbeats Pro promisess a faster and more stable wireless connection to your devices. 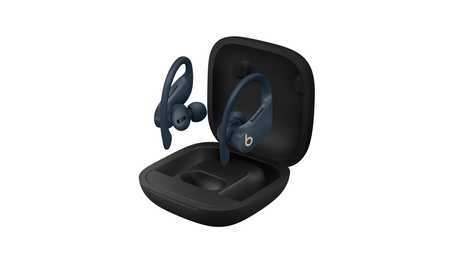 Powerbeats Pro will come in Black, Ivory, Moss and Navy for $349.95. Availability will begin in May from apple.com and Apple Stores. premium_icon Huawei P30 Pro: The best phone camera for $1599?